If you want to grow with the DWC system but Not sure which DWC system to choose, do not worry our experts will help you to choose the top Deep water culture system in your budget. It is quite difficult for non-experienced people to choose any growing system for the home. We are studying and using these systems for many years. Without wasting any time read the below-given information and get all the answers which you are searching for a long time. The H2OtoGro is best DWC Hydroponic plant growing system for beginners. The system is perfect for first-time growers. 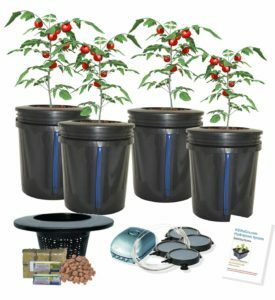 This hydroponic kit comes with 5-gallon bucket which is large enough to support high yield plants. 6 inches net cup lid, 3.2 L pump, 4inches round ait stone and growing medium with instruction manual make it best hydroponic growing kit in the market. No need to search further for the best hydroponic starter kit. This one is undoubtedly made for you. Experts advise new growers not to spend a high amount of money on growing systems until you get sufficient experience. The DWC growing kit is approved form FDA this means the bucket and all other parts of the system are made with food grade material. The blue color strip helps to maintain the water level inside the systems. No need to open the reservoir or life the closing lid. Just check the water level from the given blue stip. 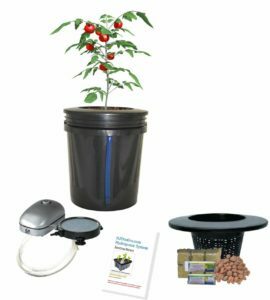 This kit has everything which you will need to start growing plants at home without using soil. If your aim is to grow more than one plant at a time by using a single growing system then this system will be a perfect choice. The kit includes 4 buckets of 5-gallon capacity per bucket. The total capacity of the system is 20 Gallon. This Deep Water Culture hydroponic growing system is perfect to use for growing 4 plants at the same time. You can grow the same 4 crops or different crops in this system. This bucket system includes one 15L air pump, Rockwool (growing medium), air stone, 6inches net pots, connecting pipes, and instruction manual. The bucket system is black in color with blue water level indicator on each. Once you close the lid the systems get completely sealed and prevent the light from entering into the system. The manufacturer uses food grade plastic and it is approved form the FDA. Select this system to grow multiple (4) plants at once. This is the best compact DWC system designed for compact spaces. It does not require much space you can place it in tiny spaces. The system is easy to use and do not require much maintenance. 100% polyethylene make it an eco-friendly plant growing system. 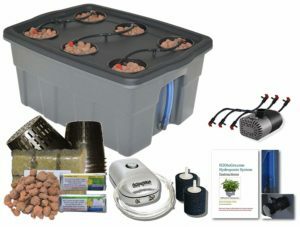 The package includes an air pump, connecting pipes, 6 plant holding pots, Rockwool, manual guide and nutrient packs for instant start. All you need to do is provide the full spectrum of light to the system. Different material is used to make each component of the system all are 100% food grade materials. It is not suitable to grow high height plants. Growers use this system to grow plants like basil, lettuce tomatoes etc which are short in height. It is easy to use and very simple to maintain. Drippers provide a nutrient solution to all 6 plants. Drip irrigation systems are wides used in the open field to reduce the wastage of sources. This is a compact version of the same technology. High-quality plastic is used which gives long life to all components. Easy to install in small spaces. Do not produce noise and looks like a decoration piece in reality. The manufacturer gives one year of warranty which covers complete kit. If in the first year of use any you found any issue with the growing kit report to the manufacturer. They will send their technician to fix it without any cost. In some cases, you need to send it back to the manufacturing facility. Oxyclone 80 is manufactured by Hydrofarm which is oldest wholesaler supplier of hydroponic equipment and grow lights. Now when we have a cloner which holds up to 80 cuttings make it possible for a home grower to use hydroponic technology. The system is powered by the Aqua Pump which forms millions of bubbles under the covering lid. High oxygenated bubble systems to grow plants with less wastage. The food grade BPA free plastic preserve the nutritional values of nutrient solution. It is not very big in size you can put it in a small space. While using this cloning machine you can use rapid rooter with it to maximize the rooting speed of cuttings. Once the cutting develops roots you can transfer them to the other growing system where they stay until harvest. Users said the product is the same as shown in the picture. The efficiency of the cloning machine is clearly visible from the star ratings. It has 4.5-star ratings on Amazon. This particular system is not available in the market. If you are interested in this you have to order it online. How to choose best DWC system for your growing area? Hydroponic systems are well known for getting higher yield form any type of plant. It is easy to grow plants at home with DWC hydroponic systems. DWC as the name suggests the system use water instead of soil. You can grow multiple crops by using the single hydroponic system. In some part of the world cropping from water is not possible due to various reasons. But this makes it possible to grow any crop by using water. In some areas, the soil is not suitable for growing food in simple words soil is not fertile enough to produce any crop. In such conditions, people use this excellent invention to grow their food. People living in areas where land is fertile but water is not suitable for farming. People use filter water to grow food at home in a DWC system. Some people are allergic to the soil, so they can use this technology for the growing crops. If you are in need of Deep-water culture system and want to buy it read the below given considerations. Our guide will help you to buy the best product. TYPE OF SYSTEM: first of all, you need to decide which type of hydroponic systems is best suitable for your needs. It will a DWC, Ebb or flow, NFT or any other type. Select the system according to the usage. While choosing any growing equipment to stay in your decided budget. SIZE OF THE BUCKET: The size of the bucket is very important. Most of the people make mistake here, they choose the smaller size buckets first and when they gain experience in indoor growing, they regret not choosing bigger buckets for further growth. Small buckets can only hold the limited amount of nutrient solution and also give limited space for the plant roots. Choose the type of plant that you want to grow first and then decide the size of your DWC system. AIR PUMP: when you select the growing system check which type of air pump is included in the kit. The air pump is a lifeline of plants growing on hydroponic systems. If the pump is under power your plant will die in 3 to 5 hours. So, check the input and output power of the air pump. EXPANDABILITY: This is another important factor it can save your money in the long term. Suppose after having enough experience you decide to grow more plants. For this, your systems should have the capacity of expandability. Buy more buckets, pipes, and increase the power of sir pump from the settings. Attach them with the existing system and you will have a bigger version of DWC. WEIGHT: If you are thinking to place your system on a table or on the shelf then you have to check for the total weight of the kit. Empty kit weight is in a few pounds. After the completion of the installation process, the kit weight increases dramatically. What is the DWC system? You are searching for the DWC systems means you are familiar with the advantages of growing plants by using Hydroponics method. These are not harmful to the environment like some sub-standard growing systems. 6 types of hydroponic kits are available to use. In DWC the roots are suspending in the water for growth cycles. How deep water culture system works? There is the main reservoir in the DWC system which holds the nutritional solution and supplies it to the connecting baskets. DWC can be a single bucket system or multiple bucket system for multiple planting. It is one of the best plants growing systems to grow plants at home. Moreover, it is very easy to maintain DWC growing kits. Besides its advantages, people choose it because this is budget friendly. The number of DWC kits are available. single bucket kits are cheap and price goes higher side as you add more buckets to the system. But still, it is affordable than other forms of hydroponic systems. The very low maintenance cost makes it best affordable system. What is the ideal pH range for DWC? The normal range of pH for DWC is between 5.6 to 6.5 for both vegetative and flowering stage. For vegetative stage keep the pH in between 6 to 6.5 and for flowering and fruiting 5.5 to 5.7 is an ideal range of ph. Remember it is very important to maintain the right pH level in Hydroponics growing kits. If due to any reason it goes higher plants will die soon. Measure it before and after supplying the nutrients to your plants. As the plant absorb nutrients form the solution the pH meter shows different readings this means your plant is getting enough nutrition. How do I know when to change the nutrient solution? Good branded nutrients last 18 to 22 days. It also depends upon the size of your plant, for large size plants you need to feed more frequently. No need to flush the entire solution and make a completely fresh batch. Throw half and keep another half now mix the new batch of nutrients in it. this type of nutrients solution id completely safe for plants. The only thing you need to do is keep eye on pH level. If the solution is contaminated or have very high pH then you need to replace it with completely fresh prepared nutrient-rich water. What is the perfect temperature for the nutrient solution? Keep the nutrient temperature in DWC between 60m to 68 F. Above this will be not good for plants and below it slows down the nutrient absorption rate. If you are in the fruiting stage means in the last stage of plant growth then you can keep the nutrient temperature low. So that you can save your nutrients solution for the next batch because the plant is almost completely developed with fruits.